There’s a lot we can learn from Kenneth Cole’s example. We recently talked about some of the biggest names in Hollywood and who they credit as their mentors along the way. 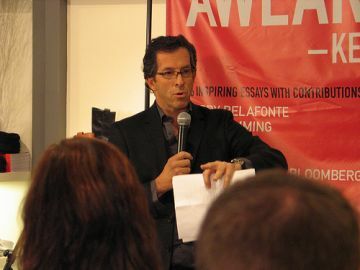 To add to this list of famous mentors, we wanted to take a moment to share Kenneth Cole’s story. Successful footwear and accessory designer Kenneth Cole did not always plan to be in the shoe business. In fact, he pursued an undergraduate degree at Emory University in Atlanta with the intent of attending law school; however, upon graduation from college, his father needed his help at his shoe factory after his right hand man left to start a competitive business. Kenneth’s father taught him the value of hard work and began bringing him to the shoe factory when he was just ten years old. His father has proved to be one of the most influential mentors in his life, teaching him the important lesson that if he wanted to succeed, he would need the support and respect of everyone within the company. Early in his career, Kenneth realized that he may not have the experience to impress his peers with knowledge, but he could make a lasting impression on others with the quality of his work. For example, if he knew the first employee arrived at 6:30 a.m. each day, he would arrive at 6:15. Because Kenneth’s father was such a great role model early in his career, he had the confidence and support to eventually start his own business. These basic principles learned from his father have stuck with him to this day and have become a vital part of his company’s philosophy. To learn more about success stories from famous mentors, please be sure to visit the Over My Shoulder Foundation online. Image Source: Be the Change, Inc. I do trust all of the ideas you have offered to your post. They’re really convincing and will certainly work. Nonetheless, the posts are too brief for beginners. May you please lengthen them a bit from subsequent time? Thanks for the post.